Tucked away from the hustle and bustle of downtown traffic is a gem of a wedding venue: a plantation with sweeping porches and Intracoastal Waterway views that dates to 1800. Megan and Luke’s Old Wide Awake Plantation wedding showcases exactly why this venue is so sought after. It’s absolutely gorgeous, and the rural Southern charm puts everyone under its spell in no time. The couple’s vision of a dream wedding required picture perfect weather since their ceremony and reception were to be held outdoors. The sometimes fickle Charleston weather held up beautifully to give Megan and Luke a picturesque day from beginning to end. “[They] could not have picked a more beautiful day to get married-the sun was shining all day, with not a cloud in the sky!” remembers photographer Rebecca Hicks. Tell us about your venue and vision! 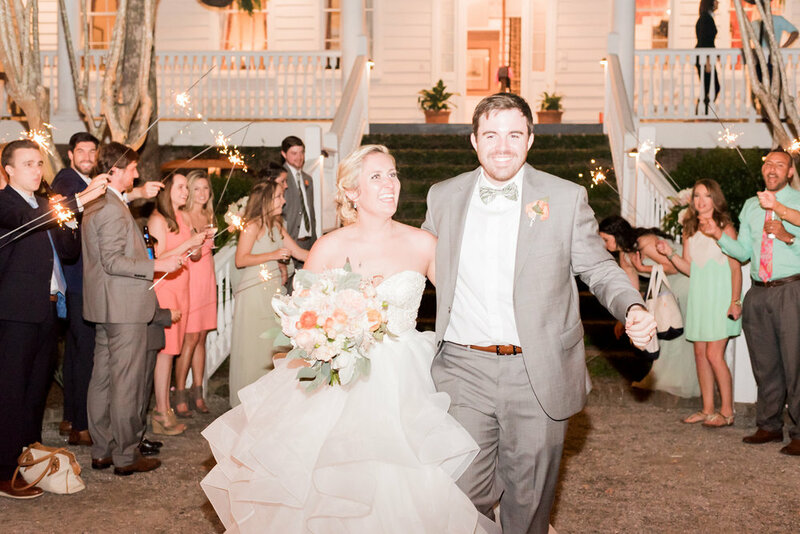 “[We loved[ the huge white plantation house, the pond with the fountain, the trees with Spanish moss, the ivy on the bricks, the wrap around porch, the long driveway to use as an aisle, and all of the greenery! “Literally everything about [the venue] was perfect. How did your vendors help you craft your day? “Our officiant, Charles Waugh, spent HOURS the weeks before hanging out with us to really get a feel for who we were as a couple and we have heard nothing but amazing reviews about how well he nailed our ceremony! “We were so blessed to become his friend. He included prayers to keep the ceremony God centered, while also including inside jokes, quotes that came from our favorite books, and picking things that matched us perfectly. “Eventhaus Rentals brought nearly everything we needed to complete our day. This company far exceeded our expectations! When we told Erica from Eventhaus that we wanted Southern and beautiful, she really went for it and nailed it! “Not to mention, we threw in some last minute changes (like adding a cigar roller) and they rolled with the punches flawlessly! “Margaret McKenzie, who was our wedding planner, works directly with Old Wide Awake Plantation and if there is anyone who could have made our day go flawlessly it was her! I called her (way too) often, emailed her (also too often) questions I had, and she always was ready with an answer or ready to go on the hunt for one! What were your florals like for your big day? “My bouquet was huge with different shades of pink and white flowers and tons of dusty sage and eucalyptus to give it the natural look. The bridesmaids bouquets were much smaller but in the same color palette and then blended perfectly. “The boutonnieres were also made to match and it all was just amazing. Across our head table was a large garland with white roses, there were hydrangeas everywhere, and she provided flowers for the dessert table which really set it apart. Tell us about your wedding day fashion! “My wedding dress was easy to pick. I knew from about a million episodes of say yes to the dress that I wanted big and layered and, boy, did I get that! “The bridesmaids used Azazie to get their dresses which was one of the best choices we made during the planning process. Not only were their dresses affordable, but I picked a color and fabric and every girl was able to choose a dress that would fit their bodies how they wanted. “I mean, who wants to spend all of the money for a bridesmaid dress and feel like you don't look pretty!? They all looked stunning, and the groomsmen definitely noticed! “Luke and I met in the library at Clemson. He was studying, I was not, and we were definitely the loudest table in the library. We spent the whole night cracking jokes and hanging out with our friends in the library. Before we knew it, the night had gone by and it was time for class. From that day, I knew that Luke was my forever. We dated for 5 years before Luke finally asked my dad if we could get married. “He planned an elaborate proposal with a photographer and fancy dinner and all of the things a girl can dream of but Hurricane Matthew was heading towards Charleston and Luke did not check the weather. We evacuated to the Upstate where my parents live and waited out the storm. “One night during the trip, Luke and I went to an Irish pub with my brothers and enjoyed a couple of beers and a lot of darts. That night Luke spilled the beans. He asked me to marry him, showed me the ring, and we both just laughed and cried and laughed and cried! “The next morning, Luke took the ring back... yes, i'm not kidding. He told me he could not propose that way and insisted on getting a "do-over." I have always been a no-take-backsies kind of girl so obviously this was not the plan I wanted!